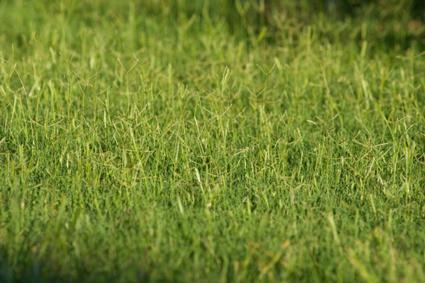 Bermuda grass (Cynodon spp.) is a tough and adaptable grass that is one of the top choices for lawns in the southern half of the country. Its all-around vigor make it a relatively low maintenance choice for lawns, but it also has a tendency to invade other planted areas, where it is difficult to eradicate. Bermuda grass is a fine-textured species that forms a very dense turf which holds up well to heavy foot traffic. It is often used for playing fields for this reason. Compared to other lawn grasses, Bermuda is very tough and forgiving, though it is not necessarily considered as attractive as some species, such as zoysia. It is inappropriate for cold climates and shady locations -- fescue is a better choice in those situations. It has thick rhizomes that creep along the surface of the soil, similar to bamboo. The rhizomes are the key to its durability as a lawn grass, but they are also what allows it to creep into areas where it is unwanted. Bermuda grass grows best in hot weather - the hotter, the better. It also needs full sun; Bermuda grass is poor choice for planting under trees or where buildings shade the ground. It's hardy in USDA zones 7 to 10. It is evergreen in frost free areas, but in colder climates it goes dormant for the winter after the first frost in fall, dying down to its roots and leaving the lawn looking brown until it sprouts again in spring. Bermuda grass grows best with an inch of water per week. It will survive on much less water, but will not look very appealing. The rhizomes are capable of withstanding long periods of drought in a dormant state and then springing back to life when water is available again, which is what makes it one of the toughest weeds to eradicate. For home lawns, Bermuda grass is typically planted by seed or as sod in spring or early summer once daytime temperatures are consistently above 80 degrees. It can also be planted in early fall, especially in mild winter climates that have little to no frost. Prepare the planting area by tilling the soil to a depth of 6 inches and raking it into a smooth surface. 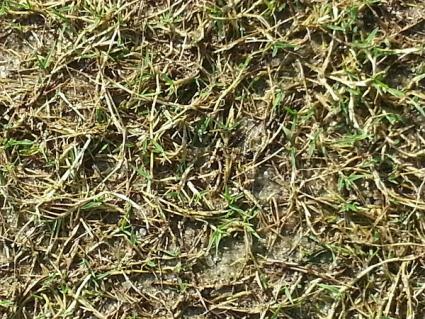 Bermuda grass is not picky about soil type, as long as it is well-drained. That being said, tilling in a bit of compost will ensure the grass gets off to a good start. You may also want to have your soil tested by the local agricultural extension service office to see if it is deficient in any nutrients or needs amendments to adjust the pH. Bermuda grass grows best if the pH is above 6; amend with lime (to raise the pH) or other soil amendments according to the test results. Sow Bermuda grass seed at a rate of 2 to 3 pounds per 1,000 square feet using a seed spreader to ensure even distribution. Rake the soil lightly to cover the seed with a thin layer of earth. Water whenever the top inch of soil is dry for the first few weeks to ensure good germination and establishment. 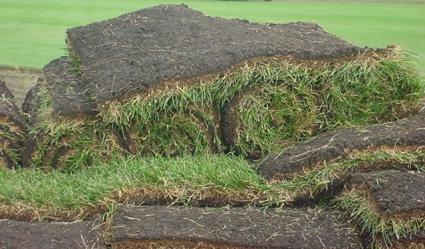 Bermuda grass sod comes in either rolls or rectangular sections. If possible, lay the sod as soon as it is obtained, rather than leaving it stacked on a pallet. If you can't use it right away, keep the sod moist until planting time. The soil preparation method is the same as for seed. Try to avoid walking over the freshly tilled soil and lay the sod from one side of the yard to the other, walking on the sod as you lay it to push it firmly into the soil. Place the sections of sod immediately adjacent to each other so there is no gap between them. For curved edges and small gaps, sections of sod can be cut to fit with a sharp spade. Irrigate and mow Bermuda grass weekly to maintain a lush, dense turf. A one-inch blade height generally works well, but avoid cutting more than one-third of the height of the grass at any one time. Fertilize every six weeks during the growing season with a slow release, high nitrogen fertilizer for best results. Weeds are less likely to appear if the turf is dense and full. Brown patch is a fungal disease indicated by areas of dead grass that often enlarge to form donut-like shapes several feet in diameter. This disease is most common in lawns that receive excessive irrigation and fertilizer. Proper management can prevent outbreaks of the disease, but lawn fungicides are an effective treatment if it becomes a problem. White grubs, which are the larval stage of several species of beetle, are one of the most troublesome insect pests in Bermuda grass lawns. They are short, thick-bodied white worms that feed on the roots and can cause cause the turf to become very thin if a heavy infestation occurs. 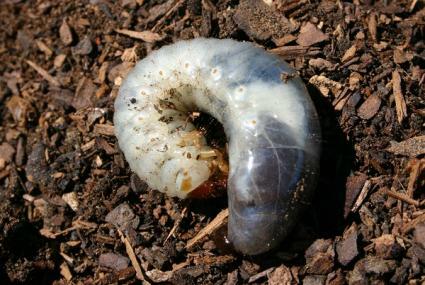 Various pesticides are available to treat white grubs though the bacteria 'Bt' is a naturally-occurring bacteria that is also an effective treatment. Dollar spot is similar in appearance to Brown spot, but the size of the dead areas is typically only a few inches rather than a few feet. It can also be treated with fungicides, but it is best kept at bay with proper turf management -- in this case, it is insufficient fertilizer and moisture that lead to the disease. If Bermuda grass invades another planting, herbicides are not much of an option because they will harm the other plants, too. The best method of control is to dig out the rhizomes as soon as they appear. Any tiny piece of rhizome is capable of growing a new plant, so it pays to be diligent and methodical when weeding them out. Spray it with an herbicide, such as glyphosate. The grass is likely to resprout from the rhizomes initially, but if you spray it repeatedly as soon as it appears, it will eventually die. Till the lawn to expose the rhizomes to the sun so they dry out. Wait several weeks after tilling and then water to see if any rhizomes sprout. If they do, repeat the process until the grass no longer grows. Cover the grass with black plastic and leave it in place for at least one month. The intense temperatures that build-up under the plastic will kill most of the rhizomes. If some still sprout after one month, till the remaining rhizomes to bring them to the surface and cover them with the plastic for another month. Bermuda grass' tough nature are an attribute when it's growing where you want it to, but make it seem nearly invincible if it pops up where it is unwanted. They key is to catch it as soon as it escapes from the lawn so it doesn't have a chance to get established.